Alexandra started working for Slatter Construction when she was still in high school in 2005, when the office staff was short handed never expecting to be here 8 years later. She attended Cabrillo College after high school taking the accounting and business classes as needed. She learned most accounting skills and organization from experience first-hand from her grandmother Christine Slatter, a couple years later Christine retired. 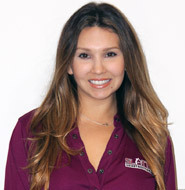 Alexandra handles the flow of all Accounts receivable and payables. Over sees all Human resources and payroll detail with help from Marc the Office Manager.